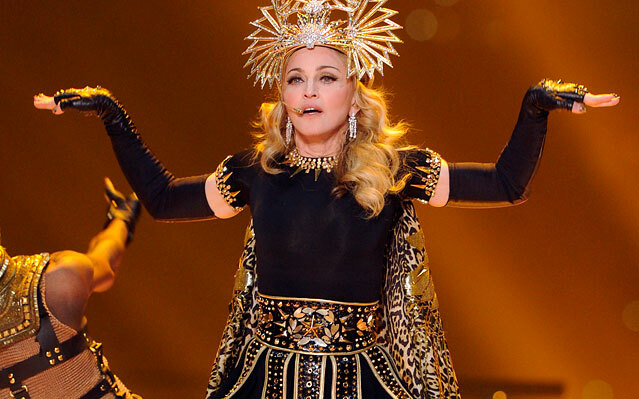 Madonna – good Superbowl halftime performance or not? Well, she was better than the remains of The Who, moved better than the Black Eyed Peas, and looked much, much younger than the Stones (even taking Keith Richards out of the comparison). On the other hand, she didn’t sing as well as U2, Bruce, Tom Petty, or Paul McCartney because, well, she didn’t sing at all. But the lip synching was really, really good, as was the agility of a 53 year old who surprisingly remains almost relevant to pop culture. The Roman Empire with Egyptian tendency themed costumes were bright and shiny, and the lighting effects were clever as always. But we’ve come to expect the spectacle. It seems it gets harder to stir the imagination as such things progress. Personally, though, I took note of two things. Sure, the halftime announcers were long-winded, but to move the staging apparatus onto the field and have it ready to go in about 10 minutes was pretty amazing. I’m surprised that there weren’t ruts in the ground from the practice runs. Despite the token appearance of Cee Lo Green and other minor celebs, there was nothing really surprising about it. Well, except… Sketchy Andy. 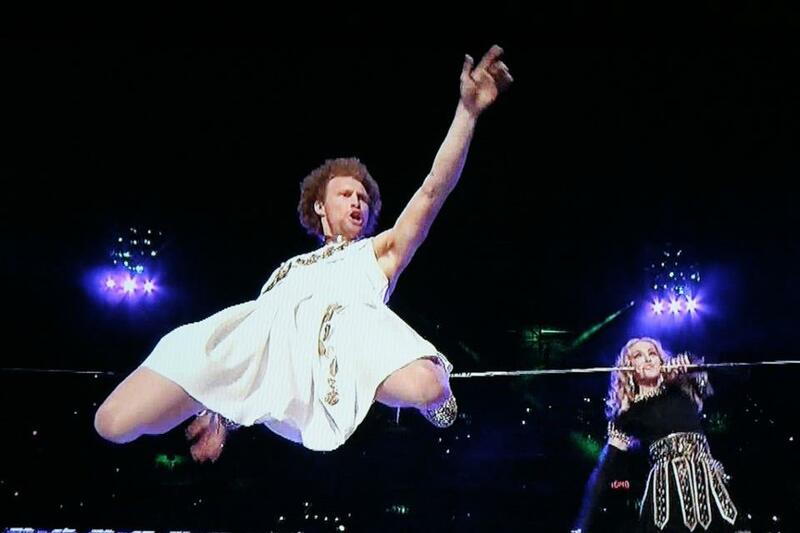 In a brief demonstration of “slacklining,” he stole show, and would have even without the toga. In a high cost production where Madonna likely had her way, this off-beat insertion was the best thing about the performance (not a concert, as there was no actual singing, but I digress…). Which brings to mind future acts. The major ones have all been tried, with success measured generally by one’s taste in music, but also on one’s charity in giving the benefit of the doubt to singers who are often well past their prime. So, why not follow up with a more professional diversion than Sketchy Andy, namely Cirque du Soleil. They’ve conquered the parking lots of major cities with their tents. They practically own Las Vegas’ entertainment dollars. Why not throw the challenge to them. In 10 minutes, what could they construct that would amaze those eager to see acrobatic feats of derring-do? And, their accompanying band plays a wide variety of music. Unlike Madonna, they could contribute a more honest soundtrack sans vocals to the Great American Spectacle.